Embossed tungsten equipment tag helps easily identify equipment, piping systems and more. By using it, you can stay consistent with your current workplace organization or start a new process altogether. 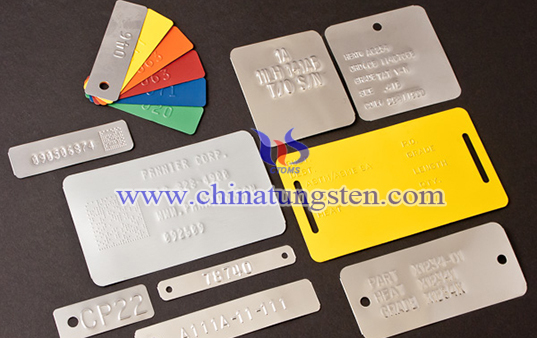 Additionally, because text and designs are raised on embossed tags, embossed tungsten equipment tag is an ideal choice in harsh conditions where they may have rough handling in industrial type applications. Embossed text has the appearance similar to text which is raised on a typical credit card. Letters are uppercase and block style for quick and legible reading. Our embossing equipment produces high numbers, uppercase letters, and punctuation symbols. 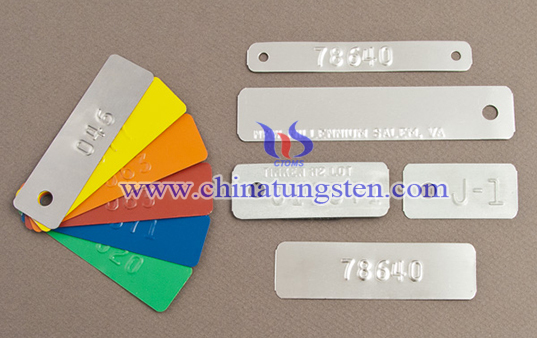 If you have any interest in embossed tungsten equipment tag, please feel free to contact us by email: sales@chinatungsten.com sales@xiamentungsten.com or by telephone:0086 592 5129696.